Lucia de Berk heeft het ondervonden: bewijs op basis van statistiek leidt gemakkelijk tot fouten. Dit project beoogt het maken van zulke fouten te helpen voorkomen. De nieuwe aanpak van het project is om de succesvolle statistische modelleertechniek van Bayesiaanse netwerken te koppelen aan goed bij de juridische denkwereld aansluitende modellen van argumentatie en scenarioconstructie. Lucia de Berk found out first-hand: evidence based on statistics can easily lead to errors. This project aims to help prevent this sort of error from occurring. The project's new approach is to link the successful statistical modelling technique of Bayesian networks to models that effectively dovetail legal argumentation and scenario construction in the legal world. Recent miscarriages of justice have increased the interest from legal practice in scientifically founded ways of treating evidence. Forensic statistics can provide such foundations. However, because of the communication gap between forensic statisticians, crime investigators and lawyers, statistical evidence is easily misinterpreted in court, resulting in wrong decisions. Therefore, methods must be developed to support the communication between the parties involved. Since lawyers are more used to thinking in terms of arguments and scenarios, we propose to develop methods that support argumentation- and narrative-based communication about statistical evidence, building on AI models of argumentation and scenario construction. We focus on Bayesian Networks, since their graphical structure can be used to express scenarios, while they also support probabilistic reasoning. To draw inferences from Bayesian Networks, lawyers must understand how the evidence was modelled and what the model means. Therefore, support tools will be developed both for the modelling of evidence as a Bayesian Network and for the understanding of the resulting network. To support the modelling of evidence in Bayesian Networks, argumentation tools will be developed to model inferences and disagreement between experts, while narrative tools will be developed to support the construction of alternative scenarios. To aid the understanding of a Bayesian Network, tools will be developed for automatically extracting both arguments and scenarios from a network and for comparing alternative scenarios. The mathematical and computational tools developed in the project will be practically assessed by means of realistic case studies and training sessions in collaboration with forensic legal practice. Vlek, C. (2016). When Stories and Numbers Meet in Court. Constructing and Explaining Bayesian Networks for Criminal Cases with Scenarios. October 28, 2016. Dissertation University of Groningen. Timmer, S. (2017). Designing and Understanding Forensic Bayesian Networks using Argumentation. February 1, 2017. Dissertation Utrecht University. defends his dissertation `Designing and Understanding Forensic Bayesian Networks using Argumentation'. ZonMW organizes the final symposium of the NWO Forensic Science research program (report in Dutch). Sjoerd Timmer's paper A Two-phase Method for Extracting Explanatory Arguments from Bayesian Networks appears in the journal International Journal of Approximate Reasoning. Charlotte Vlek's paper A Method for Explaining Bayesian Networks for Legal Evidence with Scenarios appears in the journal Artificial Intelligence and Law (2016). The paper Arguments, Scenarios and Probabilities: Connections Between Three Normative Frameworks for Evidential Reasoning has been published in the journal Law, Probability and Risk (2016). Authors: Bart Verheij, Floris Bex, Sjoerd Timmer, Charlotte Vlek, John-Jules Meyer, Silja Renooij, Henry Prakken. Charlotte Vlek and Sjoerd Timmer present papers at the 28th International Conference on Legal Knowledge and Information Systems (JURIX 2015) in Braga, Portugal: Representing the quality of crime scenarios in a Bayesian network, Explaining legal Bayesian networks using support graphs and Capturing Critical Questions in Bayesian Network Fragments. In Bielefeld, at the ZiF Center for Interdisciplinary Research (September 28-30, 2015), there is the workshop Models of Rational Proof in Criminal Law (organizers: Floris Bex, Anne Ruth Mackor, Henry Prakken), with support from the project. The program includes presentations by several project members (Sjoerd Timmer, Charlotte Vlek, Floris Bex, Henry Prakken, Bart Verheij). 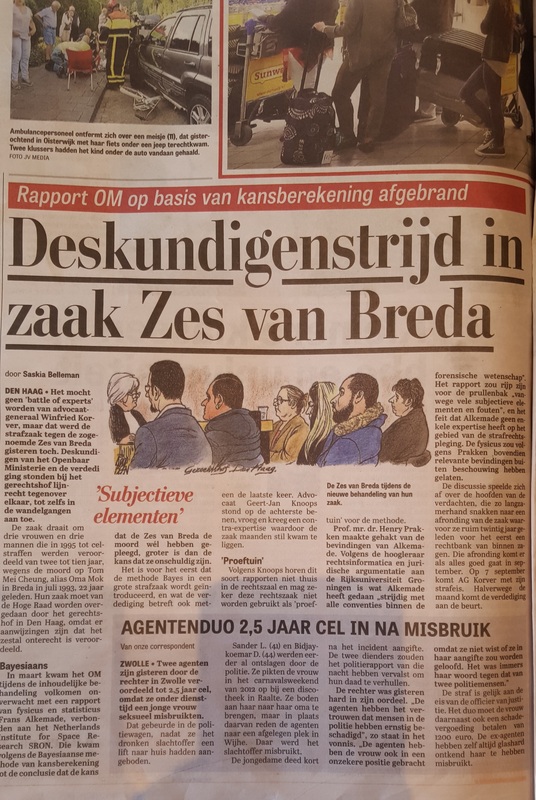 Henry Prakken serves as expert witness on the value of probabilistic analysis in a high-profile Dutch murder case: de Zes van Breda; see this news report (Telegraaf, July 7, 2015; in Dutch). At the International Conference on Legal Argumentation and the Rule of Law (June 25 & 26, 2015), the project is represented in the panel Legitimacy of Legal Decisions and Justification in Matters of Fact in Criminal Trials. Chair: Henry Prakken. Panelists include project team members Charlotte Vlek, Sjoerd Timmer, Floris Bex, Henry Prakken and Bart Verheij. On June 12, 2015, Marcello Di Bello and Bart Verheij organize a workshop Studying Evidence in the Law - Formal, Computational and Philosophical Methods at the 15th International Conference on AI and Law (ICAIL 2015) in San Diego, California. Sjoerd Timmer presents a paper at the 13th European Conference on Symbolic and Quantitative Approaches to Reasoning with Uncertainty (ECSQARU 2015) in Compiègne, France: Explaining Bayesian Networks using Argumentation. Charlotte Vlek and Sjoerd Timmer present their work at the 15th International Conference on AI and Law (ICAIL 2015) in San Diego, California: Constructing and Understanding Bayesian Networks for Legal Evidence with Scenario Schemes and A Structure-guided Approach to Capturing Bayesian Reasoning about Legal Evidence in Argumentation. Sjoerd also gives a demonstration. Charlotte Vlek, Sjoerd Timmer and Bart Verheij have organized a workshop on the forensic relevance of Bayesian Networks (April 17, 2015; University of Groningen; language: Dutch). Speakers: Silja Renooij, Marjan Sjerps, Peter van Koppen and Henry Prakken. Charlotte Vlek and Sjoerd Timmer present papers at the 27th International Conference on Legal Knowledge and Information Systems (JURIX 2014) in Kraków, Poland: Extracting Scenarios from a Bayesian Network as Explanations for Legal Evidence and Extracting Legal Arguments from Forensic Bayesian Networks. Charlotte Vlek's paper Building Bayesian Networks for Legal Evidence with Narratives: a Case Study Evaluation appears in the journal Artificial Intelligence and Law (2014). Bart Verheij's paper To Catch a Thief With and Without Numbers: Arguments, Scenarios and Probabilities in Evidential Reasoning appears in the journal Law, Probability and Risk (2014). At the Fifth International Conference on Computational Models of Argument (COMMA 2014) (Scotland, September 9-12, 2014), Sjoerd Timmer presents the demo A Tool for the Generation of Arguments from Bayesian Networks and Bart Verheij the paper Arguments and Their Strength: Revisiting Pollock's Anti-Probabilistic Starting Points. The project is well-represented at the 9th International Conference on Forensic Inference and Statistics (ICFIS 2014) (Leiden, August 19-22, 2014). Charlotte Vlek, Sjoerd Timmer, and Floris Bex present their work. Bart Verheij is a keynote speaker. On May 30, 2014, Marcello Di Bello and Bart Verheij organize the symposium Trial With and Without Mathematics. Legal, Philosophical and Computational Perspectives at Stanford University. Henry Prakken is one of the invited speakers. On February 18, 2014, the academic and legal-professional partners of the project meet in order to discuss the connections and tensions between evidential reasoning with arguments, narrative and probabilities. Bart Verheij gives an invited graduate course at the Institute of Logic and Cognition, Sun Yat-Sen University, Guangzhou, including lectures on the role of argumentation, narrative and probabilities in forensic evidence (November, 2013). Sjoerd Timmer presents the paper "Inference and Attack in Bayesian Networks" at the 25th Benelux Conference on Artificial Intelligence (BNAIC 2013), Delft University of Technology (TU Delft), November 7-8, 2013. On September 19, 2013, Bart Verheij presents the project at Codex - the Stanford Center for Legal Informatics, in a talk entitled "Can AI models help prevent miscarriages of justice?". Charlotte Vlek presents the paper "Representing and Evaluating Legal Narratives with Subscenarios in a Bayesian Network" at the Workshop on Computational Models of Narrative, Hamburg, Germany, August 4-6, 2013. Charlotte Vlek presents the paper "Modeling crime scenarios in a Bayesian network" at the 14th International Conference on Artificial Intelligence and Law, June 10-14, 2013, Rome (Italy). In the academic year 2013-2014, Bart Verheij is a resident fellow at Stanford University, participating in Codex - the Stanford Center for Legal Informatics, a collaboration between the Stanford AI Lab and Stanford Law School. On Tuesday September 18 2012, the 1st Symposium Forensic Science is organized by NWO Forensic Science program. All projects will be presented. Both vacancies have been filled. Charlotte Vlek has started in June 2012, and Sjoerd Timmer in July.